When I got quiet in yoga, silently, consciously breathing and moving for 90 minutes in the heat, when I repeatedly faced myself in the mirror and was directed to look into my own eyes and to concentrate and meditate, to attend to myself, I couldn’t help but become more consciously aware of and curious about the person staring back at me. I never made the time, or had the time and attention, to do this with myself. Life was busy, and I didn’t have the luxury of focusing attention on me in any consistent way. And, it simply never occurred to me that such a process existed or that studying myself in this way was an important activity to do to be more me, to be more alive and well (not just to feel better and be happier). It wasn’t something I learned about in school. Like so many other middle-class Americans, I was busy: surviving– working a job, raising children, navigating relationships, earning my way in a world that was expensive and costly. I thought yoga was exercise –stretching for old ladies. I knew nothing of ancient yogis or Eastern philosophy. Why would anyone spend time “being” for the sake of being when all of our time is spent on doing— producing, creating, striving, competing? I did not know what I did not know! I was not unique in my ignorance. I was conditioned, in my education (formal and informal) and by society and culture, like so many of us Westerners are, to think of knowledge as something to amass about the world– science and math and language and health and law and so forth– useful, concrete, practical forms of knowledge and skills to help me survive and properly function in the economic world so that I might feed and clothe and house myself. I loved knowing more and more, and education was something I valued. A big part of that education was about being trained to compete– survival of the fittest and all that jazz. Contemplation, intuition, compassionate listening –how could such things be of any economic value? Useless privileges for the wealthy. Unless you were raised with formal religious education (or raised with religion that was prescriptive and heavily dogmatic or otherwise perverted) such “spiritual” things were simply never part of any curriculum, at least not for me. Since religion seems to be culturally passe in the West (whether it has self-destructed or is misinterpreted or misapplied is irrelevant), what fills the void for learning about what it means to be human or how to be human? At first, when this path laid itself out for me, by sheer accident, (there are no mistakes), I was overwhelmed by the process of getting to know myself through practicing Bikram yoga. The process was challenging and disturbing and rewarding and freeing and joyful and scary all at once. I am not referring only to the physical asanas, or the hatha yoga. I am talking about the entire process of self-realization, which necessarily includes the body and mind. It took persistence and courage to be honest– to see myself honestly, and to do this alone. (It still does.) It was/is hard. The reward? The payoff? The practical and concrete outcomes? I am simply more alive, authentic, and well. I don’t need anything to fill me up fuller than I already am simply being me. I don’t need to consume more because I am enough. I have enough, and I have my integrity and my truth. I trust my intuition, my heart, to guide me to not only live in the real world and survive, but to thrive. Most people, I think, if they even know such wisdom exists within them waiting to be discovered, are still too afraid to trust and leap without the usual nets they’ve been conditioned to rely on. Perhaps they need more mentors and models (more stories! ), guides to show them the journey exists and they ought not neglect a trip through their inner landscape. I am lucky I had good mentors and models who understood the experiences I was realizing on my journey inward. The result of the process of self-realization is that that stranger in the mirror I saw more than six years ago is now my best friend– the being I trust and love and rely on more than anyone or anything. I regret that I didn’t know her sooner. I understand her capabilities, her limits, and that endless possibilities and unlimited potential exist beyond those very limits and capabilities. She is always changing and growing, often in a one-step-back and two-step-forward way. I have learned to be compassionate with myself during this type of learning. There’s still so much more that I don’t know (certainly more compared to what I do know), but I know her better than I know anyone or anything else. I know this intuitively, not only psychologically or emotionally or rationally. On a deep level, I am connected to myself more than ever. I am rarely lonely. Many people have asked me how ever did I travel for nine months alone, by myself; “weren’t you scared?” they’d ask, which was a question more about the danger of my own company rather than the potential danger of the external world. 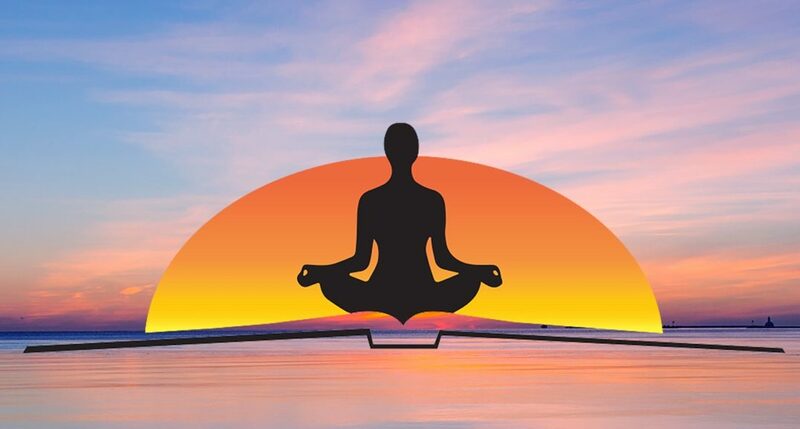 Because of Bikram yoga, a way of being through which I was able to travel extensively within my inner landscape (and there are certainly lots of other ways inward), I have the intimate relationship with myself that is foundational and absolutely necessary and required to connect with others. I can be me AND function in the world. Yoga is about balance, after all. Connecting and being intimate with any other beings, maintaining any other bond, friendship, or interaction with other beings in the world requires self-knowledge, self-understanding, and self-realization. Blaise Pascal famously said that “All of humanity’s problems stem from man’s inability to sit quietly in a room alone.” Man is, indeed, a social animal, but we are born alone and die alone and must learn to be who we are first before we can be with another or others. Sure, you can be afraid of your own company, but you can also be courageous and make friends with yourself. The first step is to simply show up. To live well, to live with integrity, all I had to do was show up– do my yoga; be there, alone, on my solo mission with myself, for myself. Now, in my current work as a writer, podcaster, and coach, I’d like to share my experience with people so that they know a thing called self-realization and self-actualization exists. I was half way through my life before I stumbled down this path that, as a teacher, I believe can be made explicit for people sooner in life so they can live healthier and wiser, rather than missing out on their own authenticity. Authentic learning, inner wisdom, ought to be developed as soon as possible and it ought to be part of education for young people. Currently, it is missing from the public school curricula, or if it does exist, it’s drowned out by the noise of achievement and grades, or buried under the heavy list of more important priorities like the status quo of competition, socialization, and indoctrination. Parents don’t demand human literacies or they innocently don’t know what they don’t know. Teachers are over-burdened with the requirements of the schooling process and administrators are accountable to, well, the accountability movement and its institutional demands. All they’ve got is their own humanity which is why the moral quality of each individual educator is absolutely paramount to the development of the students they can influence, even if no explicit “inner landscapes” curriculum exists. My discovery and road home to myself, my yoga story, has transformed my perceptions of myself and the world. I am changed, but the world has not. The nature of formal education has become ever more clearer to me since I stepped outside of it, since I understand the meaning and value of my own life, and life in general. I see much more clearly the distinction that exists between authentic learning and the process of schooling. I understand my previous frustrations I experienced as a high school teacher where I was focused on learning rather than the process of schooling, and that was an uphill battle; one of conflict and difficulty. I see now that an obvious dearth of authentic forms of learning, including any explicit instruction or curriculum about the process of self-realization is missing in the education of young people. Our schooling process simply reflects the imbalances of our society, culture, our world. I am not interested in improving the current system schooling, for perhaps it isn’t even the business of schools to implement a curriculum of connection to the self. But who shall, if parents aren’t? If there aren’t enough therapists to go around or can be afforded? The rising lack of wellness, the increase in illness and addiction of all kinds among all kinds of kids (and adults) can be addressed by at least starting a conversation about ways to alert people to and promote more authentic learning. A conversation to shift our values in education (and cultural values), re-balance our priorities, and redefine and refine the definition of a complete education and its ultimate purpose for human beings, not merely for human doings. I believe that right now, the best I can do, as one individual person, is share my stories, my experiences and my beliefs. I believe it is important for kids (and adults) to start spending time on their inner landscapes at least as much as they spend time on social media. And I am trying to figure out ways to help them find the path to self-realize and self-actualize: to deal with their fears, isolation, disconnection, inability to pay attention, and their varied illnesses which are symptoms of the current cultural health crisis. My first step is the Classic Wisdom for the Modern Human Self Study Guide. In Walden, Henry David Thoreau observed that “Most men lead lives of quiet desperation” and I believe this is still true today. Radical in their day, he and the other transcendentalists believed humans ought to be spending more time focused on learning from personal, direct experience rather than blind acceptance of dogma. They understood the value of exploring one’s interior world as well as its interconnection to the natural world. Yet, still, our attention these days is focused externally far more than internally; we are more interested in and attuned to outer landscapes than inner ones. He also predicted that man enjoyed riding upon his railroad but that one day the railroad would ride upon him; also true. Just substitute information technologies or the internet for railroad, and I would question whether or not we have made any “progress” being humans at all. What do we want the future to have that we cannot already find and be with in the present moment? What needs met, outside our ourselves that cannot be found and met within? Can we teach our kids to make time for themselves to get to know themselves rather than focusing on external tasks and social connectivity? To not allow the railroad to ride upon them? Can we teach them not to miss out on what’s happening within, rather than consoling them or attempting to control the external environment for them? Stories are powerful agents of change. If we want to make the world better, if we want to make the people we love better and strangers and friends better, then we all ought to share stories and tell our stories. My individual journey home to myself through yoga is one small, simple individual story among many that may encourage others about the value of focusing inward. I am sharing mine through my writing here, and in my books, and inviting others who have traveled the path of self-realization, self-awareness, self-love, and self-actualization to tell their stories on my Landscapes for Learning podcast. The hero’s journey, the archetypal story of mankind, is the story each of us can take and it is the way home for each human being to fulfillment and joy, a life worth living, a life worth enduring pain and suffering that is the inevitable reality for each and all of us. Sharing stories is one way we can think critically about and discuss the way we educate our kids, because the way we spend our time and attention in the educational process will determine the future of what it means to be a human being and how we determine what is the meaning and value of life, our lives– each and every one.